He who fears he shall suffer already suffers what he fears. A student once asked Swami Beyondananda: "Master, what is the Key to the Universe?" There is no key to the universe, but in this Pathways article I am going to reveal to you something similar -- the key to inner peace and happiness. But let's not rush things, I will get to this in just a little bit. 38 “You have heard the saying, ‘An eye for eye, and a tooth for tooth.’ 39 But I tell you, you are not to resist an injury: whomever strikes you on the right cheek, turn the other to him as well; 40 Whomever wants to sue you for your shirt, let him have your coat as well; 41 Whomever forces you to go one mile, go two miles with him; 42 Give to the man who begs from you, and turn not away from him who wants to borrow. 43 “You have also heard the saying: ‘Love your neighbor and hate your enemy.’ 44 But I tell you: Love your enemies and pray for those who persecute you, 45 that you may be sons of your Father in heaven." In this scripture, we are advised to offer the other cheek when someone strikes us. We are advised to walk an extra mile if someone forces us to go one mile. We are told to love our enemies and pray for those who persecute us. In other words, we are invited to do the exact opposite of what our instincts and base survival needs might dictate. It’s counter-intuitive, isn't it? What is this paradoxical advice really about? Everything about this advice seems wrong. You probably think that this passage from Matthew is mainly about forgiveness and learning to love your enemy, and it certainly is about that, but I think there is an even deeper, metaphysical meaning here. For years I puzzled over this particular scripture. Every time I heard it, I would scratch my head and wonder what it really meant, and exactly how to apply it in a modern-day setting. I could not grasp the deeper, metaphysical meaning. Now I am seeing this passage as a kind of precursor to teaching us an important life skill -- and that skill is learning to be with what is -- rather than automatically reacting and resisting. The hidden message of this passage and its odd advice is to embrace ALL of life's experiences. One way to do this is to overcompensate, to do the very thing you wish to avoid as a pathway to practicing nonresistance. It's an analogy, meant to be instructive -- to teach us to learn to become comfortable with the way it is. So the extreme advice in this passage shows an exaggeration of learning to be with what is -- by going to the next level -- beyond what is asked of us. Underneath the advice offered is an important message: the more we resist where we are, the more it controls us. Instead of “I MUST GET RID of THIS” -- in this scripture -- we are given a model for practicing acceptance. Here is what happens when you truly accept, when you move toward the very thing you wish to get rid of: something shifts -- you begin to feel more and more space around the situation -- and then the situation itself begins to shift -- it may even start to shrink. Our lives are filled with situations, people and events that we don’t want. These unwanted situations come up in our lives for many reasons, but their true value is to help us practice the witness consciousness, and to learn acceptance. But there is even more: Practicing nonresistance in our life situations offer us more than help in having a happier life, with less struggle. Rather, these kinds of life experiences offer us portals into an awakened state of consciousness. And what is an awakened state of consciousness? It is one where we are no longer conditioned to act out of old patterns. It is a state of being in which we no longer react to present events from the lens of the past. We begin to interrupt self-defeating and self-sabotaging patterns. These portals into the present moment awareness also offer us freedom. By accepting what is, just as it is, we liberate ourselves from the very suffering we seek to avoid. So in case you have not figured it out, the key I promised you is just a few words: Accept what is. Learn to befriend your experience. Learn to surrender to what is. In fact, become a master at accepting what is. Now, Divine Metaphysics teaches that there are certain Natural Laws or Spiritual Laws – also called the Laws of Mind. These Laws are unchangeable and they offer principles by which we can live our lives more happily and more abundantly. These Laws are meant to guide humanity along its spiritual path and soul progression. The Law that most relates to the topic is the Law of Nonresistance. Simply put, it states that what you resist persists! The more we push something away, the more it controls us. For example, in Jungian psychology, we learn to embrace the shadow, to love all the parts of ourselves rather than try to hide our weaknesses, shame and foibles. A similar theme is found in Taoism, which instructs us to become like water. Water is perfectly nonresistant. Imagine the movement of water, such as a river or stream, ever-flowing, traveling over boulders, rocks, obstacles, nooks and turns without struggle. Water is the perfect metaphor for how the Law of Nonresistance operates. Tara Brach, author of Radical Acceptance, illustrates the idea of nonresistance in another way. She encourages us to respond to life's problems by saying, "Thank you very much. I have no complaints whatsoever." Imagine a state of being in which you can make such a statement and really mean it! Remember the little song that we used to sing at camp? Row Row Row your boat, GENTLY down the stream . . . merrily merrily merrily, life is but a dream. Now that is a metaphysical song! Life is but a dream – life is but an illusion, the illusion is our belief that we are all separate from each other, rather than all one, divinely connected. And here we are advised to row gently down the stream, without resistance or attachment, flowing just like water. Spiritual teacher, Eckhart Tolle, also talk about the value of living in a state of acceptance, living in neither the past nor future. Tolle encourages us to "accept each moment as if you have chosen it." Now there is a powerful concept. Live each moment as if you have chosen it! Can we even imagine what life would be like if we lived according to his advice? This Law of Nonresistance includes finding the thing about yourself that you dislike the most, the piece that you are at war with, and befriending it. Think about all the energy you put into finding fault with certain aspects of yourself. Consider all the ways we resist where we are in life -- by complaining, by criticizing, by wishing we were somewhere else, by rehashing the past, by imagining that we will be happy when we achieve this or that. These kinds of thought patterns ensure that the very thing we resist has even greater power over us. But, when we are able to drop our inner resistance, space opens around ourselves. Now this may be a new strategy for some of us. It may require a restructuring of our lives. And it may take some practice -- to learn to make a conscious choice to relax into the situation that is troubling you. To "be" with it, without trying to make it go away. It means shifting attention elsewhere, such as on your blessings or your accomplishments. So start small if you want to give this idea a try. Begin with some simple "experiments." The next time you go to Starbucks and you order your grande nonfat, no foam, extra hot soy latte with a double shot and 2 pumps of hazelnut, foam on the side -- and they don't get it just right, try being open to it. Choose it, see what happens. Or the next time you are standing in line at the grocery store and you are standing in the 15 item line and someone ahead of you has a cart that is overflowing with way more than 15 items, just allow it to happen. See what happens in your life and experience. Or maybe someday soon, you will be in line at the bank and the teller is a trainee, moving really slow. Try going the extra mile, as we are advised in the scripture. Send the teller positive energy and positive thoughts. See what happens. Learn to be with it, without trying to make it go away. It means shifting attention elsewhere, such as on your blessings or your accomplishments. We never know what miracles will come from our worst life experiences. You never know. Acceptance allows the energy around a situation to take a dramatic shift. When we consciously choose to move toward that which we are resisting, it is a kind of "reverse psychology” in which you do the exact opposite of what your first reaction tells you to do. There is a wonderful Zen story that illustrates this concept. In the story, astudent asked Buddhist Teacher Soen Nakagawa during a meditation retreat, “I am very discouraged, what should I do?” Soen replied, “Encourage others.” Soen'swise response indicates that healso knew that the very thing from which you are running is controlling you. The person you feel jealousy towards is controlling you. The person you are angry with is in charge of you. ANY situation that is causing you to be in a reactive state is running your life. Now you know, and you can begin to disengage right now. I am sure you know who Michael J. Fox is. He was a terrific actor -- on television and in the movies when his life came to a screeching halt when he was diagnosed with Parkinson's disease at age 30. AT that time, he was told that he would be a complete invalid within 10 years. That was over 20 years ago. He has faced his disease with incredible grace, courage and humor and ACCEPTANCE. He made this remark: My happiness grows in direct proportion to my acceptance and in INVERSE proportion to my resistance." So acceptance allows him to live a more fulfilled and positive life. Psychiatrist Victor Frankyl talked about a similar idea which he called "paradoxical intention". In this kind of therapy, when a phobia patient is afraid that something will happen to him, the therapist encourages him to intend, or wish for, precisely what he fears. Frankyl gives an example of a young man who had severe hyperhidrosis -- excessive sweating. Whenever he had to meet with his big boss at a weekly meeting, he would perspire more than usual and would embarrassedly spend most of the meeting mopping off his sweat. Each week he would be in the same predicament -- he expected to perspire again, and this anticipatory anxiety precipitated even more sweating. He dreaded these weekly meetings because of this fear of excessive sweating. It was a vicious circle of fear, sweating, more fear, more sweating. Dr. Frankyl advised his patient to deliberately show his boss and colleagues just HOW MUCH he could really sweat. In other words, Frankyl encouraged him to make a conscious decision to sweat as much as possible. A week later, the patient returned to report that in his meeting with the boss the previous week, whenever his anticipatory anxiety was triggered, he said to himself, "At last week's meeting, I only sweated out a liter, but now I'm going to pour out at least ten liters!" In a short time, his fear reduced and so did his sweating. This method of therapy is based upon the fact that problems are caused as much by the compulsion to avoid them as the problem itself. To avoid or fight the problem focuses on the problem and results in the strengthening of the problem. By exaggerating the problem, as in the case of the sweating, and in the scripture cited above, we are no longer at the mercy of the situation we fear. Furthermore, the scripture from Matthew cited above is an excellent example of paradoxical intention. Jesus was a big proponent of paradoxical intention. "Give your shirt to the one who steals your coat." Step back, let the space open up around a particular event or situation. See what happens. Meditation on this card could be a very useful way to remind ourselves that we need to watch, observe and accept. It reminds us to take some distance from our own inner condemning, critical voices, literally encouraging us to “watch” these voices as if they had no more importance than other thoughts passing through my mind. To be able to regard our thoughts and reactions as the “antics” of the mind, to train ourselves to simply observe their maneuvers, can help us learn to be with what is . . . and this will bring inner peace. Want what you have in this moment. How do you become who you want to be? Want to be who you are right now! How do you get everything you want? Want everything you have in this moment! So, now I invite you to embrace where you are on your life path, no matter what the situation. I am not sure who said this, but I leave you with these words: "If God told you exactly what you should do and how you should be, you would be happy. Well, you are exactly where God wants you to be and you are doing exactly what God wants you to do. Be happy." Geraldine Amaral is the co-author of Tarot Celebrations: Honoring the Inner Voice and creator of “Tarot 1-2-3,” an instructional video. She fell in love with the Tarot about 30 years ago when she had her first reading and has been using, studying and writing about the Tarot ever since. She utilizes Jungian/archetypal psychology and Divine Metaphysics in her work and is a respected/gifted intuitive counselor and nationally-known teacher. She focuses her work on how to apply the Tarot's esoteric principles in pragmatic ways as well as for insights and personal transformation. Her classes provide a unique blend of spirituality, psychology, philosophy, humor, literature and personal empowerment methods. 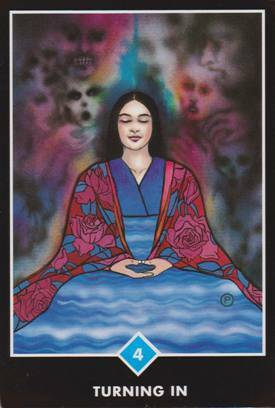 She can be reached at 703-671-7421 or geraldine@thespiritualtarot.com or her website www.thespiritualtarot.com.